Building excellent customer relationships since 2005! Since 2005, Olympic Restoration Systems has been Greater Dallas Fort Worth's leading provider of basement waterproofing and crawl space repair. Olympic Restoration Systems is proudly family-owned and operated. Our knowledgeable team of crawl space contractors is your regional licensed Basement Systems dealer, fully certified by IICRCM, and recognized by the Texas Department of State Health Services for Mold Remediation. 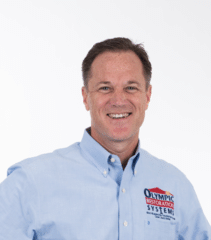 We pride ourselves on having the heart, experience, and professionalism to provide excellent customer service for our Olympic Restoration Systems customers. We belong to the Basement Systems International Waterproofing Contractor Network, granting us exclusive access to patented waterproofing products, comprehensive training and support that you won't find at your local home improvement store. We are dedicated to serving the basement and crawl space needs of the families of Dallas, Fort Worth, Arlington and surrounding areas. We value our community and are honored to give back in any way we can. Nothing fuels us like positive reviews from customers throughout the Greater Dallas Fort Worth area! Our excellence is also recognized by the Better Business Bureau & Angie's List. Olympic Restoration Systems enjoys volunteering and donating to local causes, including the Community Storehouse and Christ's Haven. Olympic Restoration Systems is proud to offer the absolute best in basement waterproofing and customer service. Whether you're in need of basement waterproofing, crawl space repair, disaster restoration or mold removal, our Olympic Restoration Systems team looks forward to serving your Greater Dallas Fort Worth family. Contact us today for a free quote in the Fort Worth, Dallas, Arlington, Plano, Garland, Irving, Mesquite, Grand Prairie, Carrollton, Denton, Richardson, Lewisville, North Richland Hills, Mckinney, Weatherford, Allen, Bedford, Rowlett, Grapevine, Burleson, Cleburne, Desoto, Duncanville, Hurst, Coppell, Frisco, Flower Mound, Euless area. We have answers to your questions -- we're here for you! Husband and wife Darrin and Suzie Saffel started Olympic Restoration Systems in 2005. Darrin enjoys helping customers' homes and lives become more healthy, and working with the great team in Houston and Dallas-Fort Worth. He also enjoys hiking, watching movies, and spending time with his family. Suzie Saffell has a B.S. in accounting and is responsible for accounts payable, accounts receivable, and ensuring all licenses are current for Olympic Restoration Systems. Suzie finds it rewarding to see the progression of a tough home improvement job from start to finish. She enjoys hiking, reading, and spending quality time with her family.